Hiya crafty peeps! Whew, it's another Monday...but the good news is that means there's a new digi release over at Some Odd Girl. I'm here to share a sneak peek at Angel Fish! I had some fun putting together this clean and simple card by using the digi stamp twice, flipping the image on one, so that it looks like there's a couple of fishy buddies :) I decided to make this a little encouragement card by making the sentiment my favorite line from Finding Nemo that I always say to myself when the going gets tough "Just Keep Swimming". 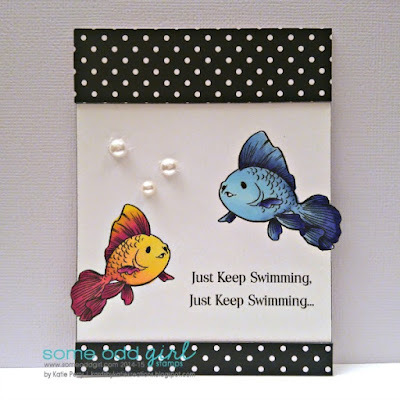 Now make sure you pop on over to the Some Odd Girl blog to see some more inspiration and to get a peek at what the other release image is and enjoy the amazing makes that the other gals on the design team put together. Thanks for stopping in to visit me! LOVE LOVE polka dots!!! The black makes your angel fish pop!